When I bought my first Apple iPad back in April 2010, after a full charge up of the battery, the first thing I had to do was connect it to my PC to set it up. You simply could not use your iPad until it was activated and the only way to do that was to install iTunes on a computer and connect the two together. I thought nothing of it at the time. Yes, £500 would have bought me a laptop, but in no way did I see the iPad as being my main 'PC' but as a partner device to be used whenever it felt more appropriate. Two years down the line and one upgrade later (I've made some comments on the upgrade decision here) and the iPad no longer needs a PC to setup. In fact, Apple advertise it as a 'post-PC' device, suggesting that the iPad is capable enough now that you don't need a PC at all! Whether or not they're right is not a point I will attempt to debate here. It probably boils down to what you use your computer for. I shall need my Windows laptop for work for the foreseeable future, but must admit I rarely need to switch it on when I get home. The iPad looks after everything! However, there is one area of computing where the iPad falls short when compared to my trusty laptop. Blogging, or more specifically, typing. Whilst I'm pretty quick at typing on the touchscreen keyboard and will happy bash out a Facebook comment, tweet or email, I don't find it a particularly enjoyable experience for typing for longer periods. So, when the 2012 iPad (Apple are calling it the 'new iPad' but what will we call it when the next one comes along???) was launched and I'd already sold my original in anticipation, I decided it should be accompanied by a keyboard. There are hundreds of options, almost all use bluetooth (ie they will connect wirelessly with the iPad and need their own battery), but broadly speaking, some are integrated into cases and others are smaller, portable versions of their desktop equivalents. 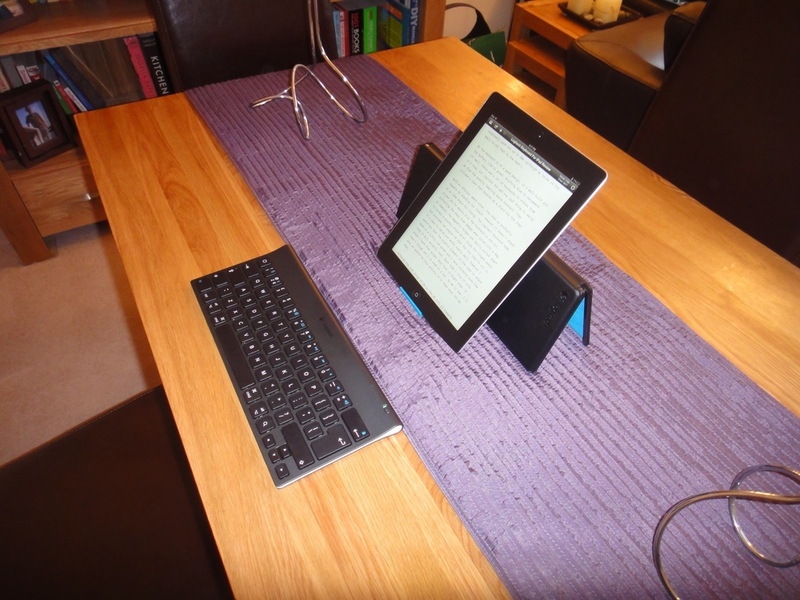 I decided against the case style ones, as I do not blog every day and the touchscreen keyboard is fine for the rest of the time, and I would not need one with me at all times, so after some research I settled on the Logitech Keyboard for iPad . At a shade under 400g with the 2x AA batteries and measuring 29cm by 13cm, it's portable enough to live in my rucksack if I'm anticipating doing some writing whilst out and about, or be stored out the way at home when I'm short on ideas. Battery life is quoted at 10 months, so generally it's not even a consideration. Setup is easy. Simply switch on 'bluetooth' in the iPad's 'Settings' menu and then switch on the keyboard and press the 'Connect' button on the underside, which will appear on the iPad within a few seconds. Tap on it in the list and a few more seconds later you're ready to go. You only have to do this once, as the connection is remembered and the ipad will automatically connect to the keyboard everytime it's turned on. I would note though, that I did switch bluetooth off on the ipad in the end and only turn it on when I need it, as I noticed the battery goes down a bit faster, even if you're not using it. Still, it's all pretty convenient. The iPad also detects when an external keyboard is connected, so the touchscreen one never appears and you can work with much more of the application displayed. In use, the Logitech Keyboard for iPad is up there with a quality laptop. The chiclet style keys (rather than being placed directly next to each other, the keys are slightly spaced out) have a good feel on pushing and look to being close to full sized. If you're used to typing on a laptop keyboard, you'll be immediately at home here. Although to keep the size down, you don't get the numberpad,often on the right of a computer keyboard, you do get cursor keys and some iPad specific keys. The iPad specific keys are a nice touch. For example, at the top left of the keyboard is the equivalent of the iPad's 'Home' button and the top row of keys have second functions for media playback, such as 'Play', 'Skip', 'Stop' etc as well as quick access to the iPad's photos app. These could be particularly convenient if you like to connect the iPad to the stereo and would like a way to wirelessly control music playback. The range is supposedly good for up to 30m (although my house is too small to put that to the test!). So the keyboard is of a good design, it's well built and the battery life is great. Anything else to recommend it? Well, there are a lot of keyboards to choose from it's true, but Logitech did add one last thing to swing me from the equally tempting Apple keyboard. They included a case that doubles as a stand for the iPad. With an official smart-cover, the iPad is perfectly capable of standing for itself. However it doesn't stand at an ideal angle for typing. The Logitech keyboard case allows you to easily slip the keyboard in and out, protecting the keys from damage when piled into a bag. On removal, the magnetic hinges are easily pulled apart to reveal a plastic stand which clips the hinges apart and provides two angles of rest for the iPad to sit in. It's easy to setup and works really well, however I would say that the plastic element of the case in stand mode is a little low-grade and I have concerns over how long it will actually last. Each time I clip it into place I have that slight fear that it might snap. It hasn't though and I've used it a lot, so we'll see. I'll post an update to this article if it does ever let me down.